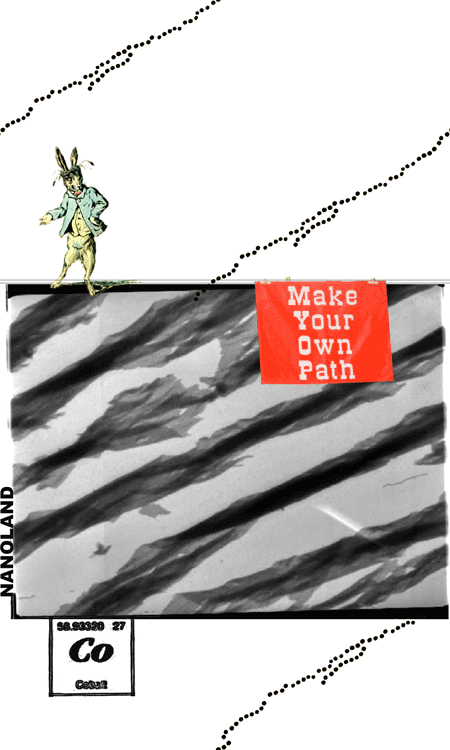 "Promenade in nanoland propose an imaginative one-hour tour through nanoparticles self-assemblies, the forms and structures which inhabit the extremely small (from our macroscopic world). Songs and texts accompanies a collection of transmission electron microscopy obtained from the evaporation of colloidal nanoparticles solutions (like coffee into water) onto transparent substrates (carbon ultra thin films). In nine chapters the submicrometric world is extensively observed. Together with the images there are pieces of a relate which it turns to be part of it. A relate which narrates a journey, which more than a journey is a childbirth. An indefinite trip, indeterminate, introspective, which should lead to the world through a metaphoric uterus. (vivo sin vivir en mi). With characters which could be anyone at any moment in any place. The music accompanying the images has been capriciously extracted from my personal collection of records of the last 4 years, during which the scientific Project was carried out. I hope that the promenade will be pleasant and widens the chest and caress the spirit and frees the imagination to understand that other worlds constantly exist and co-exist. Let you be moved, thanks" Victor F. Puntes. >Extracted from lab notes: "Project: Metronom 04. After meeting each other, Science becomes Art." Exhibition at Metrònom in Barcelona from January 27 to March 6, 2004.